When Daniel Meyer was on his cross-country trip visiting the United States from his native Switzerland, he stopped midway in central Texas. Some locals told him he should really try to spend some time in Fredericksburg, the quintessential Texas Hill Country town. Meyer immediately fell in love with the area and decided to buy some property and build a small establishment. Just two miles from downtown Fredericksburg, Daniel has created Barons CreekSide, the perfect getaway for visitors to the Texas Hill Country. Conveniently located just minutes from the main street of the popular tourist town, Baron’s Creekside is peaceful, tranquil, and beautiful. And Daniel’s newly opened bistro, The Club, is the best place in town for great food, drink, and music. Recent specialties have included chicken lasagna, fish tacos, and other tasty treats cooked up in The Club’s kitchen. We enjoyed the gumbo, a flavorful chicken and sausage creation with just the right mix of spice. Paired with an excellent house wine, our evening meal was excellent. Daniel, the warm, energetic proprietor of Barons CreekSide, stopped by for some friendly conversation. He entertained us with stories about coming over from Switzerland to America and starting Barons CreekSide, including the fascinating story of moving a large Swiss farmhouse to Fredericksburg and using the materials to build many of the cabins dotting the property. The Club also offers a fine selection of Texas and International wines and craft beers. Be sure to try one of their own wines, boutique wines made by their partner Kuhlman Cellars with grapes grown right here at Barons Creekside. You can also enjoy tastings on Saturday afternoons at The Club. Thoughts: My wife and I have spent many wonderful days and nights in the Texas Hill Country, and our evening at The Club has to rank high on the list of our experiences. Starting with the beautiful scenery of Barons Creekside and the friendliness of Daniel and his staff, The Club is a welcome destination after spending the day exploring the Texas Hill Country. The food was excellent, the wine superb, and the staff was friendly and efficient. With the outdoor patio overlooking the vineyards on the property, the setting is peaceful and beautiful. The layout of Swiss cabins dotting the property for overnight visitors with the creek, towering oaks, and rolling hills creates the perfect country setting. Overnight guests can pick from one of twenty cabins, including the Zermatt, Wasserfall, and the Lucerne. When you are on property at Barons Creekside, you feel like you are far from civilization, out in the wilderness many miles from the hustle and bustle of main street. However, you are actually less than five minutes from the heart of downtown Fredericksburg with its many shops, museums, tasting rooms and other fun and educational attractions. With a Swiss flag marking the entrance, visitors pull up a winding paved road towards the cabins and The Club. Two steers, one representing America and one Meyer’s homeland of Switzerland, mark the spot where visitors hang a right and head up the hill to The Club, the intimate bistro, with a large patio overlooking the vineyard. Music is a big draw for locals and visitors to The Club. High quality live music can be enjoyed in the evenings on the large outdoor patio, which overlooks the vineyards. Music can be enjoyed year-round, with plenty of shade and fans for summertime and a fire pit, heaters, and comfy blankets for cool nights. Blues, Swing, Americana, and other popular styles of music grace the intimate stage. And, of course, The Club is “the place” to view those spectacular Texas sunsets. 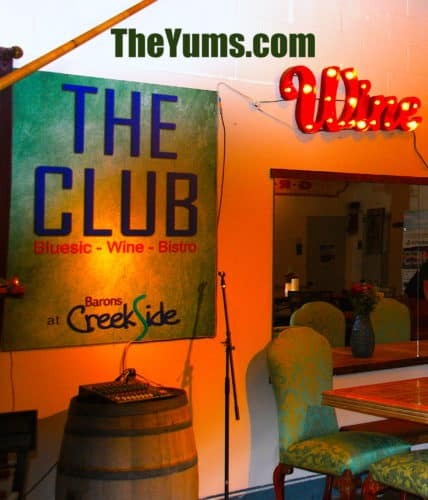 If you want to experience the true Texas Hill Country, visit The Club at Barons CreekSide. Have a great meal, some wonderful wine, and friendly conversation. Sit back, relax and enjoy the music, the vineyard, the rolling hills, and the warm Texas sunset. Disclosure: The author received a complimentary meal on his visit to The Club.